This hand-force device MAP series is made for rehabilitation treatments after accidents. The real time mode of the hand-force device MAP series evaluates forces of a sick person or an athlete. In the peak mode the hand-force device MAP series shows the values even when the measuring process is done. 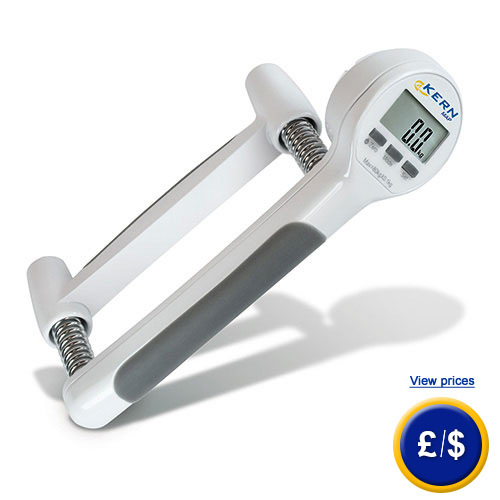 At the same time the hand-force device MAP series is able to measure average values of two hand grip forces. 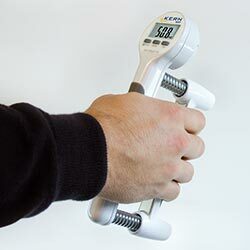 Especially during training this hand-force device MAP series is very interesting because of the counting function. This function documents the number of the pressing procedure via a preinstalled limit force. With this hand-force device MAP series, you can check and control a health status and of course you can train it. The hand-force device MAP series is a handy device, easy to use and equipped with non-skid rubber grips. Through its changeable clips, several degrees of hardness are adjustable. Therefore several groups of patients will be able to work with this hand-force device MAP series. This hand-force device MAP series, manufactured by Kern, is made for applications in health centres, medical sports sector or in the field of gym. This device is equipped with an automatic switch-off function that will work after 1 minute. Therefore this hand-force device MAP series is perfect for rehabilitation centres. The hand-force device MAP series can be put aside after usage. This will save staff and energy. If there are any questions about the hand-force device MAP series, have a look at the technical specification below or call: UK customers +44(0) 23 809 870 30 / US customers +1-410-387-7703. Our technicians and engineers will gladly advise you in all hand-force devices and all other products in terms of regulation and control, or scales and balances of PCE Instruments. Secure and comfortable usage of the hand-force device Kern MAP through its anti-rid rubber grips. 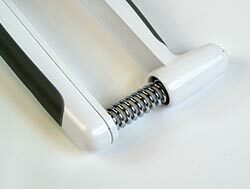 Two changeable springs on the hand-force device Kern MAP ensure a fast increasing of capacity. in Hungarian in Polish in Serbian in Russian in Turkish and in Portuguese .